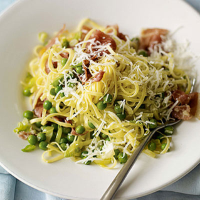 At this time of year, it’s a joy to use the freshest young podded peas with elegant taglierini. Otherwise, frozen peas or petits pois will be your best bet, because they’ll still be sweet enough to handle the salty prosciutto and Parmesan. Melt the butter in a frying pan, then add the salad onions and sweat gently until soft. Add the peas and a dash of water. After a couple of minutes, stir in the prosciutto.